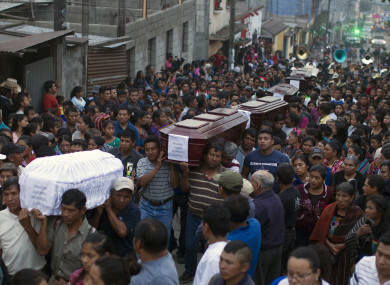 People carry to the cemetery the coffins of seven people who died during the eruption of the Volcan de Fuego on Monday in Guatemala. NEARLY 200 PEOPLE are missing and at least 75 have been killed since Guatemala’s Fuego volcano began erupting over the weekend, officials have said. The 3,763-metre (12,346-foot) volcano erupted early Sunday, spewing out towering plumes of ash and a hail of fiery rock fragments with scalding mud. Email “At least 75 killed and 200 missing after volcano erupts in Guatemala”. Feedback on “At least 75 killed and 200 missing after volcano erupts in Guatemala”.